For those of us that spend winter days outside, there are several descriptions we use for bitterly cold conditions. Some say, "frigid". Others may say "arctic", and still others may use the term, "unbearable". But when we stepped out of the lodge in south-central Missouri on that late January morning, the only thing that came to my mind was that it was "stone cold". The 7-degrees was being pushed around by 20 mile-an-hour winds. That is stone cold. Why would three relatively intelligent men choose to leave a warm fireplace and a cozy lodge to walk out into those conditions? We were on a mission. My new cameraman, Jason Waters, and I had traveled to southern Missouri to hunt with Justin Hoffman. Hoffman owns and operates STONE CREEK HUNTING RANCH (www.StoneCreekHunting.com). Our mission was two-fold; we were going to try to call in a wild boar with a new CASS CREEK BOAR CALL and also film the hunt for Justin. We had a great plan, but had not counted on the harsh conditions. Justin had our hunt planned. 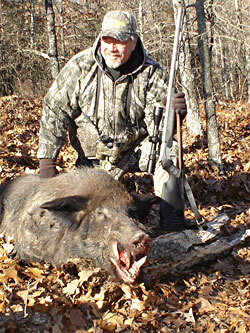 STONE CREEK RANCH is well over 500-acres, but has more that its share of wild hogs. We were going to move from ridge to ridge, spotting with binoculars. Justin usually uses the tried-and-true hunting method of spot-and-stalk on this property. Today would be a bit different because of the calling aspect of this hunt. We glassed for about 2-hours before we spotted the boar I wanted. "He's a brute," Justin said as we watched the boar from a great distance. "I hope you can get him in," he continued. "We've never killed one that big here," he ended. Now the work started. If you are not familiar with the Ozark Mountains of southern Missouri and plan to hunt there, bring your best boots and get in shape. It is a good thing this place has hogs because it is way too rough to grow any crops. We finally got close to the location where we first saw the big boar. Justin was working the call so that Jason could film and I could shoot. The CASS CREEK WILD BOAR CALL makes five different sounds including a feeding frenzy, contented feeding, social grunts, fighting boars and feeding piglets. Since this hog was so big we decided to try the fighting boar call. Within seconds of Justin turning on the electronic (battery operated) call, hogs were coming from all directions. We must have seen 8 to 10 hogs responding to the sounds of the call. But the one I wanted was not among them. "We need to get higher up this mountain," Justin said. We moved uphill several hundred yards. "Let's try here," I suggested. "Before we get all the way to the top." Justin hit the call again and the excitement began. We had walked right by the huge boar and when we saw and heard him he was already at a charge from behind and below us. He was foaming from is chompers and coming at a dead run. The situation was way too fast and way too close to shoot. Justin managed to run the hog off by hitting him in the snout with a softball-sized rock, as Jason was being backed into a brush-pile. It took us a few minutes to recover from that encounter. "Our work is cut out for us now," Justin said. "We just educated that big boy. He won't come back to the call now and he knows we're here. Get ready for a lot of hiking," he ended. This charge took place at about 10:30AM. We did not even see the boar again until after noon. Then we had two spot-and-stalk rounds that put the huge hog within 50-yards of us, but we could not get the camera and my crosshairs on him at the same time. At about 3:00PM we spotted him on a ridge top, feeding. At Justin's direction, we made a move to get in front of and below him. Justin's knowledge of the land and his experience with these animals proved invaluable. After making our move, Jason double-checked the camera and I did the same with my rifle. I was shooting one of the new THOMPSON/CENTER ARMS .50-caliber Encores called the Pro Hunter. I had taken three deer with this Pro Hunter in the fall and was very comfortable with it. I scoped my muzzleloader with an ALPEN OPTICS APEX Model 4030, 3x9 variable, and was shooting 250-grain HORNADY Lock-N-Load SST-ML sabot bullets. This is the deadliest muzzleloading combination I have ever shot. We heard the boar just seconds before he appeared on the opposite hillside above us. I heard Jason start the camera and heard Justin whisper to verify that he was the one we had been hunting. At about 50-yards the boar stopped and started rooting in the leaves. I had the crosshairs of the APEX just behind his front shoulder, but there was no word from Jason. For those of you that have never been involved in filming a hunt, the cameraman calls the shot. Not until he is satisfied with what he sees through the viewfinder can the hunter take the shot. If the cameraman calls the shot and the hunter cannot shoot, the whole process starts over. A kill on film is not made until and unless both the cameraman and the gun have perfect shots. You cannot imagine how difficult this can sometimes be. The boar continued to feed down the hill. My crosshairs never left his chest. At about 30-yards I heard Jason whisper, "Shoot!" Smoke filled the air as my Pro Hunter belched out the HORNADY bullet. The slug hit its mark and the giant boar went only 40-yards. 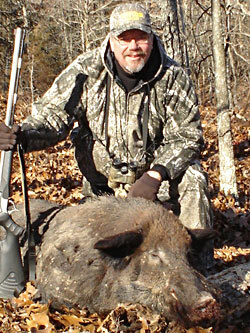 The hog weighed well over 400-pounds and had cutters that were bigger than any I have ever seen. It was hard work and we were as cold as three guys could be and still be having fun. There is, however, one very humorous situation that I must pass on to you. Our hands were so cold and the boar was so heavy we could not get him lifted up onto the small bed of Justin's ATV. We wrestled the hog for over an hour before we decided to go back to the lodge and get a pallet to use as a stretcher. Even with this, it was all the three of us could do to get him lifted and loaded. 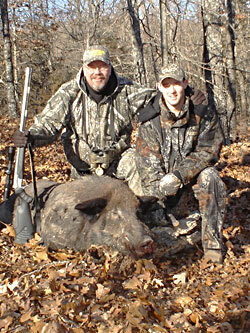 STONE CREEK HUNTING RANCH offers the very best hog hunting anywhere in the country. They also offer great hunts for exotic species, as well. Their lodge is warm, comfortable and beautiful and the food is good and plentiful. Justin Hoffman is a great host and a better guide. This will be an annual destination for me from now on. Contact Justin at the Ranch at 573-435-0188, or at home at 314-952-4346, or check out their website at www.StoneCreekHunting.com. Copyright � 2012 Mike Roux Outdoor Enterprises. All Rights Reserved. Designed by Hunter Connect for Mike Roux Outdoor Enterprises.